We're only a few hours away from WWE Payback, and after getting only 50% for TNA's Slammiversary, I better step up my game. Now I've had my problems with this match since it was announced. Firstly it was a messy build up with the match seemingly being changed on the fly to include the two extra falls. Secondly, this feud really doesn't have enough behind it to warrant this kind of match, especially when compared to the previous Three Stages of Hell matches. As well as the three match types chosen not being particular favourites of mine. 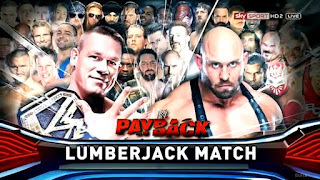 However, part of the build has been effective such as Ryback's path of destruction over recent weeks. I won't be expecting this contest to be a hold for hold, catch as catch can classic, but it might, just might tell a decent story if put together correctly. I see Cena picking up the first fall in the Lumberjack match after some hi-jinx with the lumberjacks, closely followed by Ryback slamming Cena through a table (maybe more than one) and dominating Cena for most of the Ambulance Match until Cena makes his comeback. 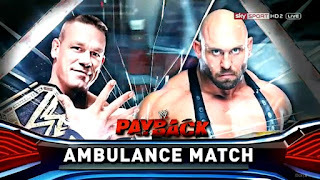 I wouldn't be surprised to see a similiar ending to Cena's Ambulance Match with Kane, seeing Cena AA Ryback off the Ambulance. This rivalry was harmed somewhat by Ziggler's concussion which kept him off Television until last Monday's Raw. With WWE forced to tread water with a series of matches between Del Rio and Big E Langston, there really isn't much to talk about here in term of built up for this match. Ziggler and Del Rio are both good technical wrestlers and this should be a very good contest, it would have been even better if it were given a heated storyline to back up what was going on the ring. I'd be very surprised if Ziggler lost the title here, as what would have been the point keeping the belt on him throughout his injury just to drop the title here. A lot of people have been discussing the idea that this match might not take place, and even the CM Punk might not turn up. I've got to say it would be a foolish move on WWE's part for a number of reason, most importantly a lot of the Chicago fans will have payed good money to see Punk's return. If WWE does this, it will not help garner CM Punk heat from his hometown, it will garner WWE themselves heat, Chicago is full of smart wrestling fans and they will know when they are being played. Personally, I think this match will go a head, and with the claims made by Jericho on Smackdown this past week, I'm expecting nothing less than an absolute classic. It's going to be hard to top their previous contests, but I'm sure these two could find a way. I'm predicting a CM Punk win in his home town, but also think we could see some shenanigans come the end of the contest. This match has been well built up to over not only the last month but since way before this year Wrestlemania, even if WWE didn't intend to do so originally. It seemed at the start of the month, that WWE would go for the team of Orton and Sheamus to face the Shield, but these plans were quickly changed and now we have this match. The dynamic between Orton and Bryan is an interesting one and a nice development in what is essentially a branch of the Team Hell No storyline. With Daniel Bryan currently the hottest property in WWE, I'd expect another top notch performance from not only him but everyone in this contest, with the storyline seemingly reinvigarating Randy Orton as of late, well he certainly looks a lot less bored at ringside. With Orton and Bryan seemingly moving into a match with each other at Money in the Bank, before Team Hell No faces of at Summerslam, I'd expect the Shield to retain here, after some dissension from Team RK-No. Certain people haven't enjoyed how Curtis Axel has been built up since his re-christening the night after Extreme Rules, I for one am not one of these people. Personally, I think having matches with big names like Triple H and John Cena, and not losing certainly helps build Axel as a character and the manner in which he wins helps him garner even more heat from the crowd. He's also had pinfall victories over Chris Jericho, Wade Barrett and Sin Cara and looked impressive in all of these wins. However, his replacement for the injured Fandango in this contest has certainly played with the dynamic of the match, and I'm not sure it's a positive move, mainly because Fandango and Barrett were too different types of heels and I think Axel and Barrett might be a bit too similiar. If given time it has the potential to be a good match, and I'm torn on who's going to pick up the win in this one. 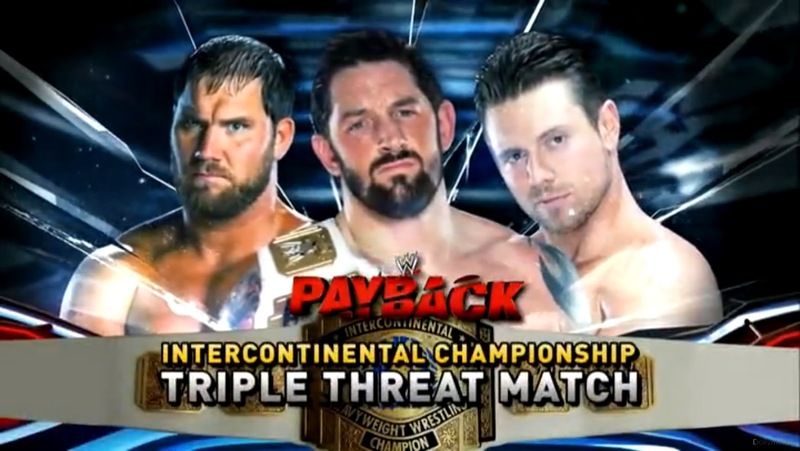 I can't see The Miz getting the nod as we've already seen him take the title from Barrett. So it's between Axel and Barrett. I'm going to say Barrett retains, but pins The Miz with Axel possibly getting distracted by somekind of outside interference. With this match being swiftly made on this weeks Raw, after a Disqualification win for Kane in a non-title match up, it would be easy to say that there is not enough to warrant this Pay-Per-View contest. However, if you've been watching WWE over the last six months, you'll know there has been a lot gone on between The Shield's Dean Ambrose and Kane. Although their television contest wasn't exactly a barnburner and suffered from time constraints and the frustrating ending, hopefully this match will go a little longer and get a clean finish. I'd expect Dean Ambrose to retain the title against The Big Red Monster and continue his title run into Summerslam at least, with Kane building towards the Team Hell No pay off. Now, for the most part this rivalry had featured some pretty embarrasing segments, which were difficult to sit through. 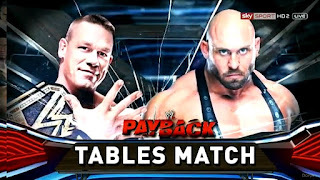 But when this rivalry got serious, it became a lot easier to watch, hopefully this match will go a similiar way, because when Sheamus does serious as seen in matches with Antonio Cesaro on Main Event, he can really put on some good in ring action. 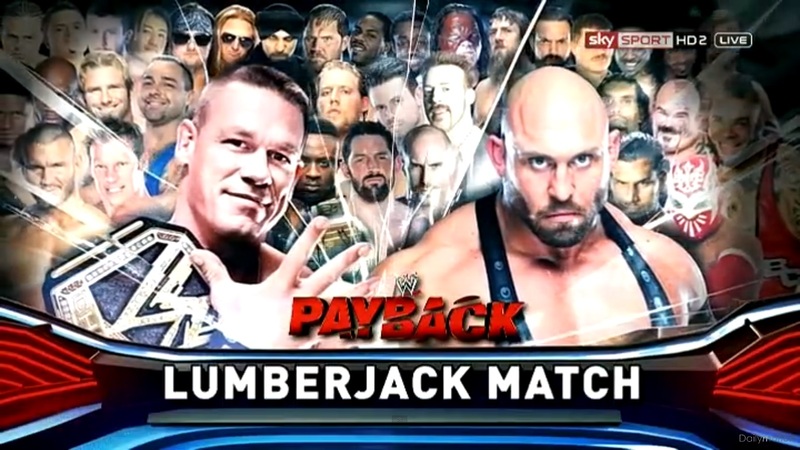 This match would benefit from some extra time, but with this being the Pre-Show, I would expect it. I'd like to think WWE would go with Sandow in this one and allow this rivalry to play out a little longer, using the more serious elements, however I reckon it's gonna be a Brogue Kick from Sheamus to finish this feud for now. 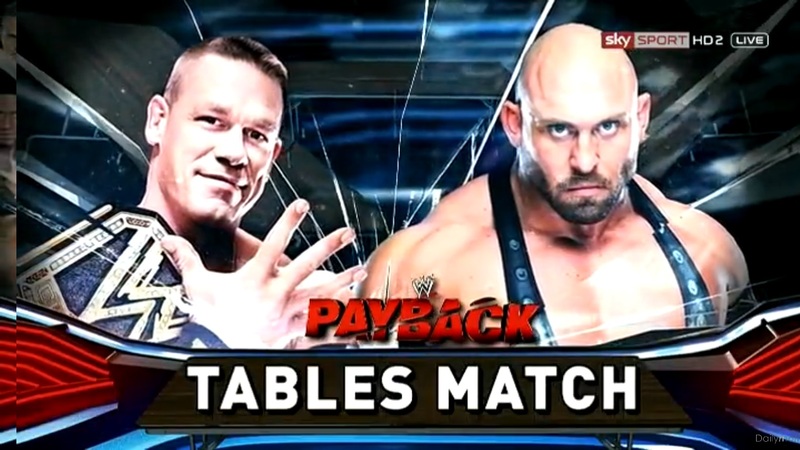 Right, that's my Payback Predictions. For what it's worth, I expect this to be a good show, however with a lot of matches looking for the attention and extra time, I think a few of these contests may be slightly disappointing. Enjoy the show!